→What Is The Best Lasagna Pan For Your Kitchen? What Is The Best Lasagna Pan For Your Kitchen? Lasagna is an Italian delicious dish. This dish is enjoyed throughout the world. It is made by combining the tomato sauce with cheese confection, meat, and the gooey mozzarella cheese. This food is baked in rectangular or square pans. 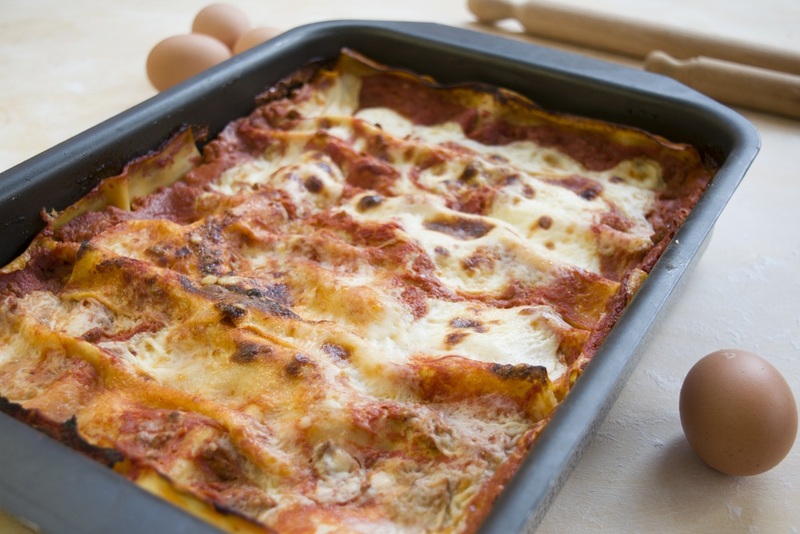 To enjoy this delicious meal at home, you need the best lasagna pan. The following information will help you to choose the best. A lasagna pan is a cookware that is used for baking, ro﻿﻿asting, and serving. This is versatile bakeware in any kitchen. Different pans are made of different materials. The pan is used to cook the lasagna dish. They come in different shapes, dimension, sizes, and materials. The best pan should have the additional features like handles, a rack, a spatula, and other important features that you may need. The Chicago Trio ﻿﻿Metallic ﻿﻿Lasagna Pan, 12 by 15 By 3 Inches. When buying a lasagna pan, consider the number of people that you will be serving. Most pans are large and medium sized. Choose a pan that will allow you to cook enough food once. Ensure that the pan you choose will fit in your oven perfectly. It should not be too large or too small. Choose an ideal size that will satisfy your cooking needs. The best pan should be easier and simple to clean. some pans can be cleaned in the dishwasher. Ensure that you check the manufacturer’s instructions on how to wash the lasagna pan. The shape of the pan is very important. This is because of the length of the noodles. The lasagna should be in a pan that is deep to have the sauciness. If the pan is round, it may not be ideal for making lasagna. You will need to break the noodles. A rectangular or square pan is ideal for your lasagna. When making lasagna, it should have build-up layers. Choose a pan that will help you to make about 5 layers if possible. The pan should be 2-4 inches deep. A deep and long pan is ideal. Pans are made of different materials. You can get an aluminum, enameled carbon steel, stainless steel, copper, cast iron, and nonstick pans. Consider the durability and performance of the material that you choose. Aluminum is a good conductor of heat and light weight. This will react with food that is acidic. The ceramic pans heat up gradually. This cannot react with food. These pans are not nonstick. The ones that are made of glass cannot absorb any odor or flavor. They can be used to brown your food nicely. This is an important feature that should be considered when buying a lasagna pan. This is because you need to lift the pans comfortably and safely. The handles should be sturdy and strong. Some handles are riveted. The lasagna pans are relatively cheap. Ensure that you choose a pan that you easily afford. Most of the pans are below $50. It should be within your budget. Ensure that the one you choose satisfies your cooking needs. This appliance is elegant. It is made of stainless steel. It comes with a roasting pan. The size is ideal for making the best lasagna that is multi-layered. The side handles are riveted for secure and comfortable gripping. 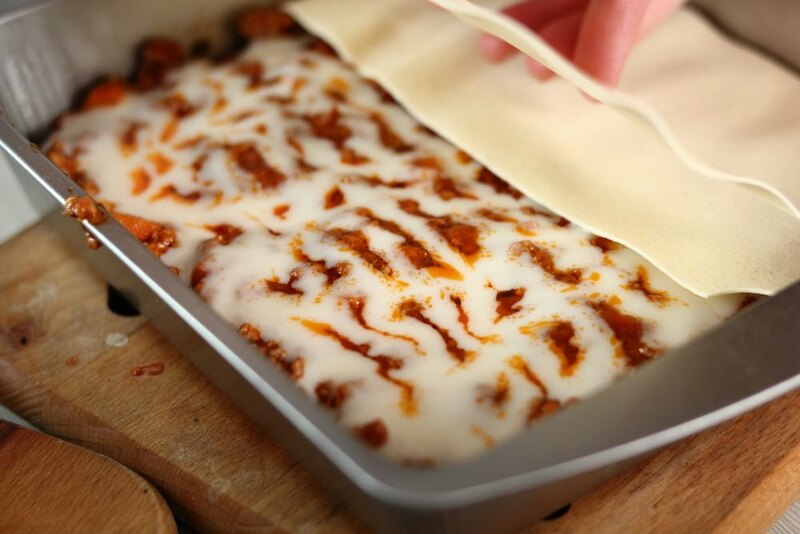 You can easily transport the lasagna to and from the oven. The interior is also made of stainless steel. It cannot react with the food. This ensures that the flavor and the taste of the food are not affected. The pan can be used for serving buffet or dinner. The interior and the exterior have a stainless mirror finish. The pan cannot react with food. This ensures that the taste and flavor of the food are not affected. The pan has handles that are riveted for strength. You can transport the pan to and from the oven safely. The pan can fit in a standard oven perfectly. The interior and the exterior have a stainless mirror finish. The pan can be used to make casseroles, lasagna, and au gratin potatoes. It comes with a roasting rack that is made of stainless steel. The pan is elegant. You can use it for serving buffet and dinner. You can use it to make deep-layered lasagna. The pan may warp on the first use. The material used is very thin. It is not resistant to corrosion, flaking, and discoloration. The pan is vibrant and beautiful. It is ideal for roasting chicken, melting your cheesy lasagna, and topping a meal with the blueberry cobbler. The pan is versatile. It can be used for serving fruits or salads. It has a rectangular shape. It measures 9 by 13 inches. The pan is constructed from a stoneware that cannot react with food. It can be used safely in the microwave, oven, dishwasher, and in the freezer. The bright color will perfectly match with other kitchen appliances. It has handles that are wide for easier and comfortable transport around the kitchen and dining table. It can be used to prepare two servings. This is because it is small. It has handles that are wide for easier and comfortable transport around the kitchen and dining table. The bright orange color will perfectly match with other kitchen appliances. The interior is nonporous glazed. It is durable and long lasting. You can safely use the pan in the freezer, microwave, and in the oven. This makes it versatile and convenient. The pan can be taken directly from the oven to the table for serving. The handles have wide holes that will allow you to have a secure grip from any angle. The pan is ideal for making enough food for a large number of people. You can easily melt your cheesy lasagna or roast chicken. It is resistant to stains. This is because it is nonporous glazed. It may break in the oven at high temperatures. Relatively expensive as compared to other pans. It is a little bit large. The pan measures 13 by 9 by 2.5 inches. It is versatile and designed for boiling, baking, roasting, and serving. It can be used to prepare small portions of food. The depth is perfect for making layered lasagna. It is made of porcelain that is of high and fine quality. The heat distribution is even. This ensures that the food cooks evenly. The handles are easier to hold on both sides. You can securely take the pan in and out of the oven. It can be used to cook other foods like casseroles, scalloped potatoes, meatloaf recipe, desserts, and others. You can also use it as a roasting pan and serving dish for your vegetables. The leftovers can be covered with an aluminum foil and put in the fridge. It can be used safely in the oven, microwave, broiler, and the freezer. The pan cannot transfer colors, odors, flavors, when in use. The cleaning process is easier. You can clean it in the dishwasher safely. This pan is durable and long lasting. This is because it is made of high-quality porcelain. It is versatile. You can use it to bake lasagna, casseroles, cakes, roasting chicken and veggies, and also use it to serve your food. It can be used safely in the broiler, oven, microwave, and the freezer. It can be used to store and reheat the leftovers. It is easier to clean, it can be cleaned in the dishwasher safely. You can take it from the oven to the table. It is deep enough to prepare layered lasagna and other foods. The pan cannot transfer colors, odors, flavors, when used. The size is ideal for convection ovens. The dimensions are not accurate. It is not deep enough. It is not resistant to shatter and scratches. This pan will make your baking process easier. It has a premium coating that is non-stick. This ensures that the food is released effortlessly. It is long lasting and durable. You can safely clean it in the dishwasher. It is resistant to scratches, you can use metal spatula safely. The pan is made of steel that is 0.5 gauge. It has a lifetime warranty. The pan has a full lifetime warranty. It is resistant to scratches, you can use metal spatula safely. You can safely clean the pan in the dishwasher safely. It can fit in a standard convection oven. The pan is nonstick. This makes the cleaning process simple. The pan may warp in the oven. It is not resistant to scratches, ensure that the spatula is used carefully. It may rust if it is not cleaned well. The pan has 3 channels that are separate. They are side to perfectly fit the standard lasagna noodles. This will allow the food to cook separately. You can easily serve the carnivores and vegetarians from the same dish. The performance of the pan is excellent. It is easy and simple to use. It can be lifted out of the oven. It comes with a spatula that perfectly fits to lift pieces of the food. The food does not stick to the pan. This makes the cleaning process easier. You can use the pan to prepare other foods like the eggplant, brownies, or the zucchini that is layered. You can make three foods in one batch. It is made of nonstick that is coated. The pan can be cleaned in the dishwasher safely. It is made of steel that is nonstick coated. It comes with a spatula that perfectly fits to lift pieces of the food. Food cannot stick. This makes the cleaning process simple. It has three channels that are sized to perfectly fit standard lasagna noodles. You can make three meals in one batch. This is because it has three channels. The sections are not large enough for the standard noodles. It is not resistant to flaking. I like the Rachel ray stoneware rectangular lasagna lover pan. This is because the pan is vibrant and beautiful. It is ideal for roasting chicken, melting your cheesy lasagna, and topping a meal with a blueberry cobbler. It can be used for serving fruits or salads. It has a rectangular shape. It measures 9 by 13 inches. The pan is constructed from a stoneware that cannot react with food. It can be used safely in the microwave, oven, and in the freezer. The bright color will perfectly match with other kitchen appliances. It has handles that are wide for easier and comfortable transport around the kitchen and dining table. You can freeze it in the dishwasher safely. The pan is ideal for making enough food for a large number of people. The pan can be taken directly from the oven to the table for serving. The handles have wide holes that will allow you to have a secure grip from any angle.